The great outdoors, regardless of time of year, heals your soul. The scenery inspires you, the fresh pine and cedar-scented air electrifies you, and the sounds of critters and song birds uplift you. And if you experience the Yosemite region on snowshoes, it will entirely redefine your outdoor perspective. On the surface (get it? ), this activity is easy to learn, relatively inexpensive and poses little risk of injury. You can go as fast as a snowshoe hare or as slow as a wintry tortoise and still burn a decent number of calories (420-1,000 calories/hour). And the best part? It doesn’t require a TON of snow and gives you access to parts of nature that normal hikers can't enjoy in the winter. 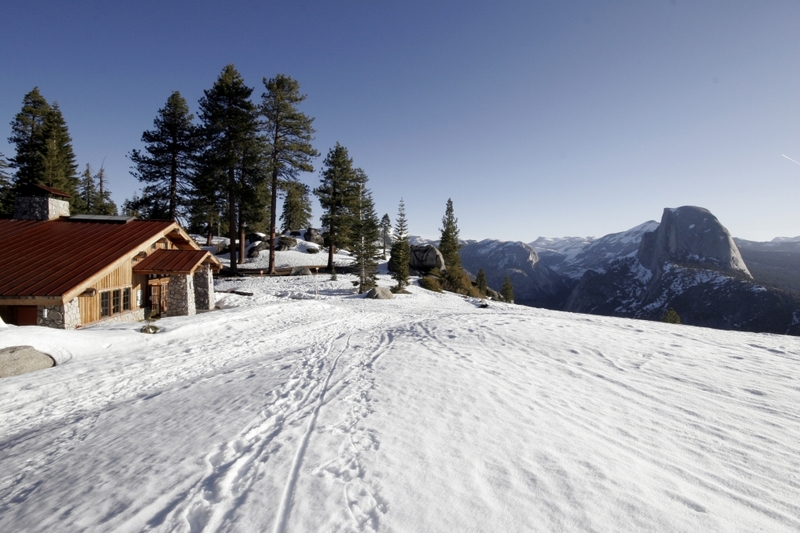 Just outside the south gate of Yosemite National Park, this all-season resort has a perfect introduction for those who are a little hesitant to take their first snowshoe step. 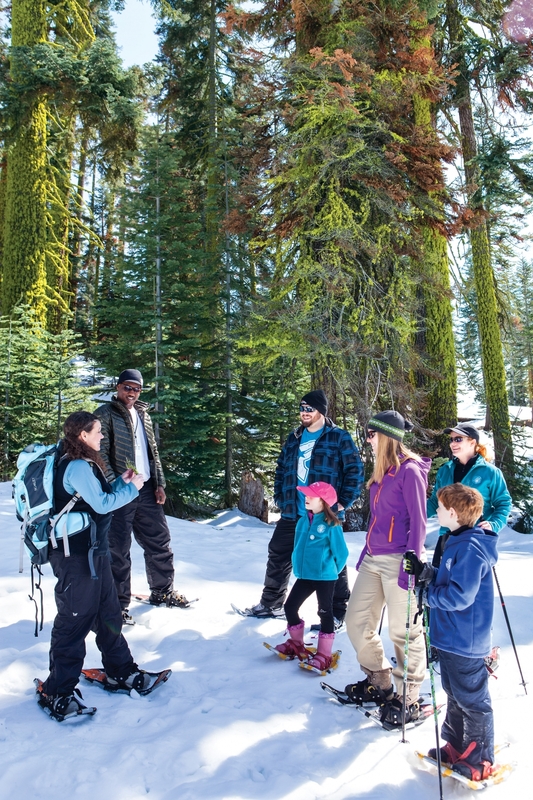 Starting at 10 a.m., you’ll join a Tenaya guide and venture into the snowy landscape of the Sierra National Forest on the Tenaya Lodge Nature Trail. 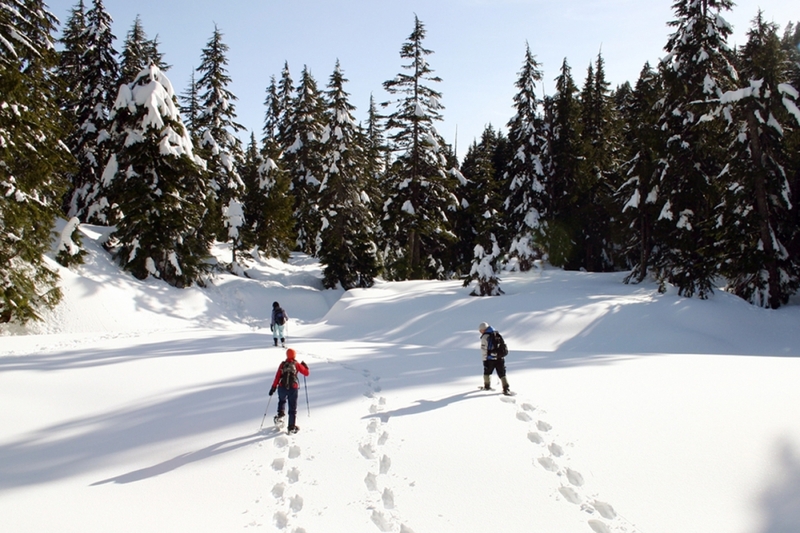 It's a perfect 1.5-mile round-trip snowshoe hike surrounding the hotel. Self-guided exploration of the trail is also an option as well as bigger excursions in the surrounding forest. You can also experience the beauty of the area by starlight on a mile-plus guided snowshoe hike by flashlight. 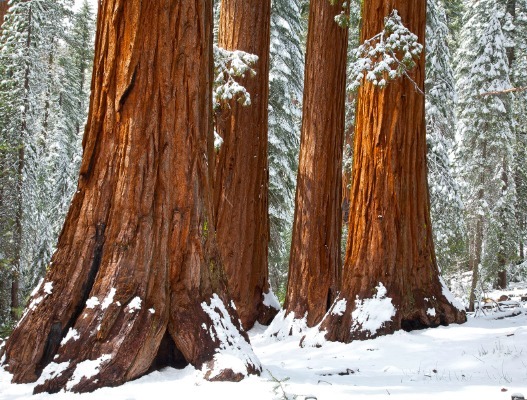 This list wouldn’t be complete without us talking about one of the ULTIMATE snowshoe adventures in our neck of the woods - the Mariposa Grove of Giant Sequoias. Most of the year, you can take the free shuttle from the new Mariposa Grove Welcome Center to the Mariposa Grove Arrival Area and then begin your exploration of the area. But in the winter, it becomes a snowshoer’s ultimate paradise. 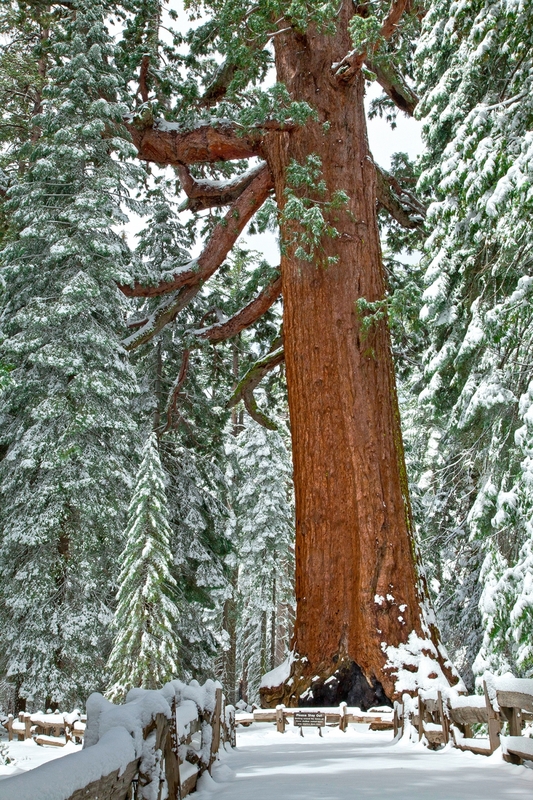 The road shuts down, giving those who are willing to do the two-mile journey the reward of seeing these giants in a unique and tranquil setting. Still a bit too crowded for your liking? Then consider heading to Nelder Grove. Many visitors & residents alike are unaware of this hidden jewel which is situated 12 miles outside of the southern entrance to Yosemite. This area was named by John Muir after meeting the retired miner who homesteaded & lived on the land until his death in 1889. This 1,500+ acre grove offers outdoor lovers the chance to see about 100 mature Sequoias up close & personal, along with a healthy crop of young ones too. In the winter, it provides even more solitude since you would need to snowshoe the final bit of unpaved road from Sky Ranch into the grove itself (note - the distance to the grove from where you park can vary depending on the road conditions). The effort is well worth it. For those looking for a more serious snowshoe excursion, the trek to Glacier Point is where it’s at. A 21-mile round-trip with an elevation gain of over 2,400'+, it can be done in a 12-hour day. Or better yet... break it up into a two-day journey with a stay at the fabulous Glacier Point Ski Hut. Towering at 3,200’ above the valley floor, the culmination is one of the best views of the entire park. At the hut, you’ll be given a rare opportunity to see it in solitude overlooking such landmarks as Half Dome, Vernal and Yosemite Falls, North Dome, Basket Dome, Grizzly Peak, and on a clear day, pretty much all of Yosemite's High County peaks! Glacier Point is the big adventure, but if you want something shorter still with some killer views, there are several spots along Yosemite Valley's south rim that will more than reward you for the effort. Inspiration Point (several hundred feet up from the famous and heavily trafficked Tunnel View) to the winter trek favorite, Dewey Point are just a couple of recommendations. 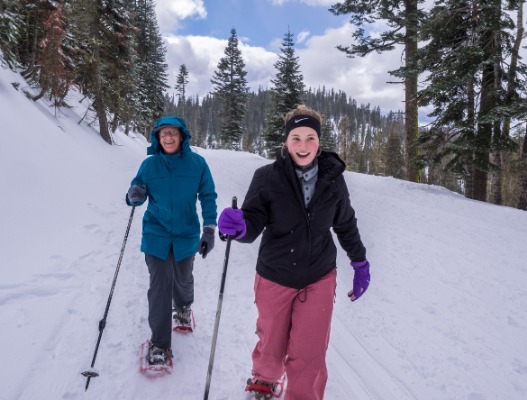 Trails are accessible from Glacier Point Road and if you need maps, info or equipment rentals, make sure to visit the folks at the Yosemite Ski and Snowboard Area's Nordic Center. They will get you all set up. If you are looking a guided option, we can't recommend enough the experienced folks at YExplore Yosemite Adventures.